Back row from left: Isaac Frumkin, Matthew Evenson, Cara Schultz, Competition sponsor David M. Rubenstein, Emilia Majersik, and Mike Grimes. Front row from left: Fariha Bablu, Zoree Jones, grand prize winner Riya Ashby, Amanda Liu, and Emily Stein. Click here to view more photos from the award ceremony. "Several great entrepreneurs, including Bill Gates and Mark Zuckerberg, dropped out of college before getting their degrees. How important do you think a college education is to your future success?" Back row from left: Josephine Brané-Wright, John Merlo-Coyne, Kurien Thomas, Mazzen Shalaby, Samuel Norman, and Roslyn Hall-Wurst. Front row from left: Emma Reese, grand prize winner, Summer Oh, Competition sponsor David M. Rubenstein, Matea Bebic, Tyler Johnson, and JA President & CEO Ed Grenier. Click here to see more photos from the awards ceremony. “George Washington or Dr. Dre: Who would you consider a greater entrepreneur and why?" Back row from left: Competition sponsor David M. Rubenstein, Anene Uwanamodo, Marie Hatch, Zachary Stevenson, Seyi Anifowose (standing in for Ifedamola Anifowose) and JA President & CEO Ed Grenier. Front row from left: Renee Beck, Natalie Pargas, grand prize winner Xiu Chen, Emma Reese, and Ayibatari Owei. Not pictured: David Fischer. Click here for more photos from the awards ceremony. still thriving in Greater Washington?" Back row from left: Nicholas Zolnerowich, Arijeet Sensharma, competition sponsor David M. Rubenstein, JA President & CEO Ed Grenier, Eli Kane, and Douglas Andre. Front row from left: Rebecca Davis, Jeanne Hathway, grand prize winner Dylan Culfogienis, Natalia Jamro, and Johanna Siegel. Not pictured: Nathan Ausubel. Visit Facebook or Flickr for more photos from the awards ceremony. "Should young Americans be required to spend at least one year in public service or is such a requirement an unnecessary government intrusion?" Back row from left: Jonathan Rasch, Zubair Khan, Lucas Lin, JA President & CEO Ed Grenier, competition sponsor David M. Rubenstein, Robert Young, David Proakis, and Jack Baker. Front row from left: Aditi Subramaniam, grand prize winner Mimi Robinson, and Isabella Boland. Not pictured: Chase Ammon. From left: JA President & CEO Ed Grenier, grand prize winner Daniela Hernandez-Fujigaki, Sepehr Zomorodi, Aras Scimemi, Isabel Hendrix-Jenkins, Caitlin Paul, competition sponsor David M. Rubenstein, Austin Wright, Nicole Obongo, Seamus Kirkpatrick, and Isabel Berg. Not pictured: Katie Thomas-Canfield. From left: JA President & CEO Ed Grenier, grand prize winner Fiona V. Lam, Matt G. Ashley, Sayo E. McCowin, competition sponsor David M. Rubenstein, Azeezat A. Adeleke, Raquel M. Reed, Enoch O. Ajayi, Sam R. Pearl-Schwartz, Sergio A. Ribeiro, and Marvin D. Millner. Not pictured: David Zhang. How can young entrepreneurs and the local governments of DC, Maryland, and Virginia work together to empower the next generation to improve the quality of life for the citizens of Greater Washington? From left: grand prize winner Jacob S. Rasch, Stacey L. Zhou, Adam M. Middleton, competition sponsor David M. Rubenstein, Catherine S. Zucker, Gabriela D. Garcia, Jingran Wang, Nina J. Lu, Thomas W. Temesgen, and Lydia M. Evans. What can the Greater Washington business community learn from today's high school students? Front row from left: Junior Achievement President & CEO Ed Grenier, Maya I. Krishnan, Caroline B. Sherrard, first place winner Scott S. Yu, Mica L. Moore, and competition sponsor David M. Rubenstein. Middle row: Steven J. Goldberg, Jane E. Kessner, and Madeline M. Alpert. Back row: Luke M. Smith, Wilbur E. Shirley, and Katrina L. Hauprich. How can Greater Washington Companies Responsibly and Effectively Deal with the Economic Challenges Facing the United States? 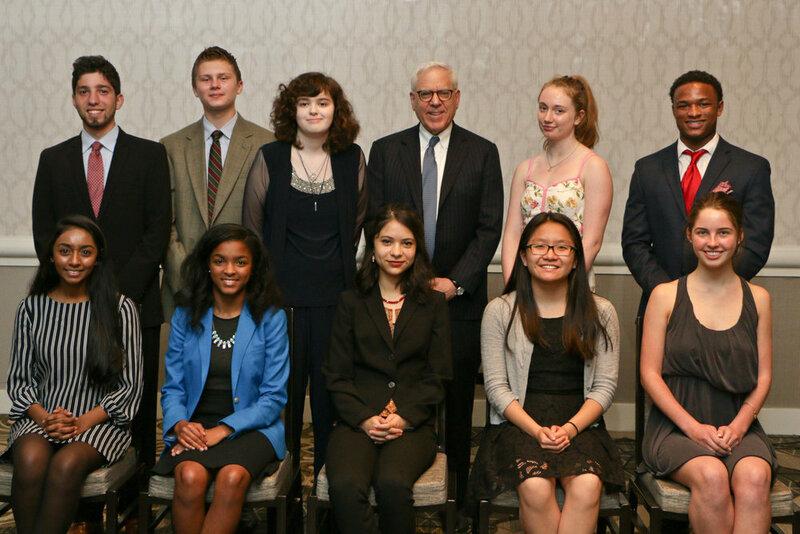 Mr. David Rubenstein with the Junior Achievement Essay Competition winners. From left: Oriana Bughi, Donald Borenstein, Jeff Rappaport, Dave Ramish, Elena Perry, Nicolás Lulli, Mr. David Rubenstein, Marielena Faria, Sophie van Bastelaer, Kevin Chai, and Justin Wolin. Greater Washington – Why it's the Best Region to Build and Grow a Business.